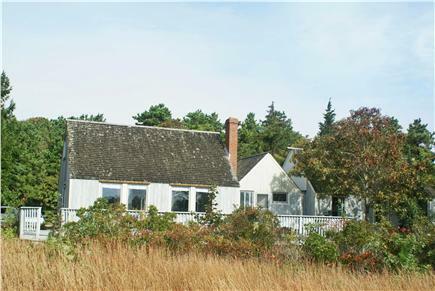 This bright contemporary home offers a beautiful view of the meadow and a small peek at Sengekontacket Pond. Walk to a sandy, private Association beach which is perfect for small boats, kayaks, and windsurfers. 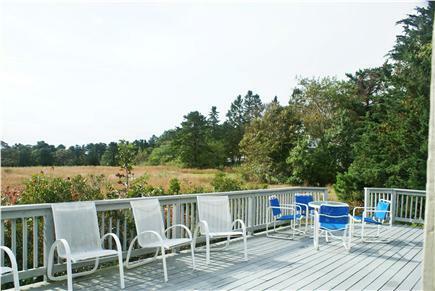 There is a large deck overlooking the meadow with table, chairs, and a market umbrella which accommodates 8 people. 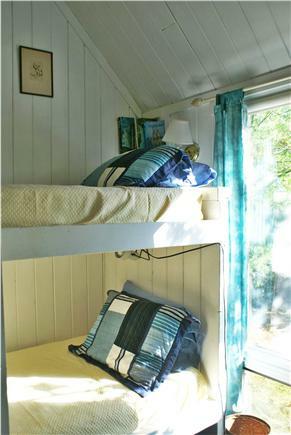 The light and airy inside has two bunk rooms, a master bedroom with attached bathroom and ceiling fan, and a bedroom loft over the kitchen. 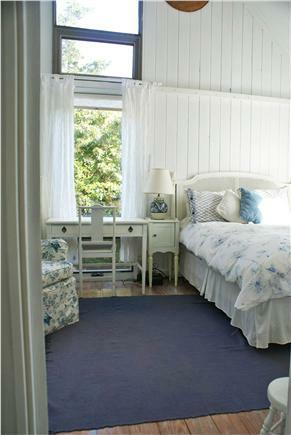 The second 1/2 bath is accessible to the other bedrooms and living room. 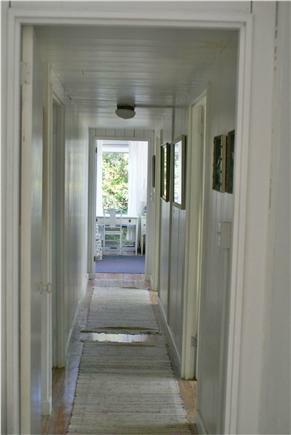 There is a front entry hall leading to the laundry room. 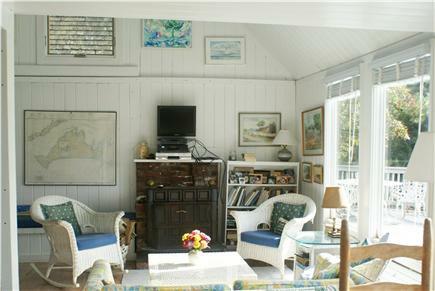 The living room with a Franklin stove and ceiling fan leads into the dining alcove, which can accommodate 8 people easily. 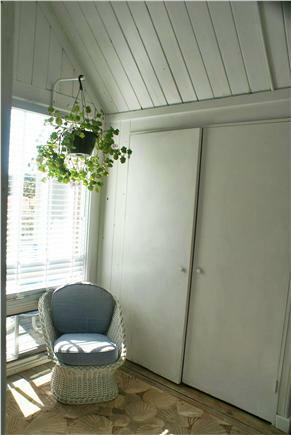 There is an enclosed outdoor shower accessible by way of the front door. This home is next door to the beautiful 18 hole Farm Neck Golf Course, which also has 4 tennis courts and a very nice restaurant which is open for lunch and dinner. 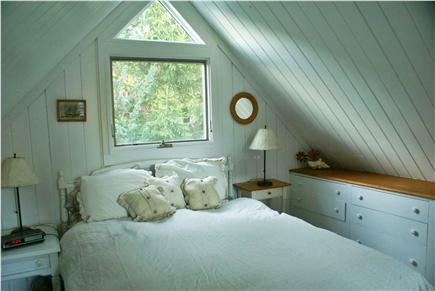 Everything is on one floor with the exception of 1 bedroom loft with a queen bed. Seven of us stayed for a week in this lovely home. 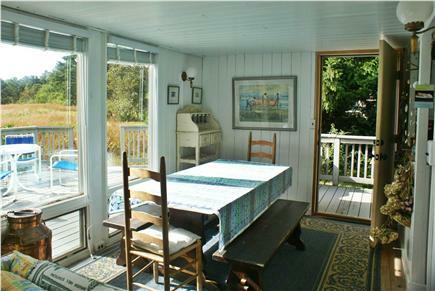 It is in a quiet area, but a short drive to restaurants and beaches. 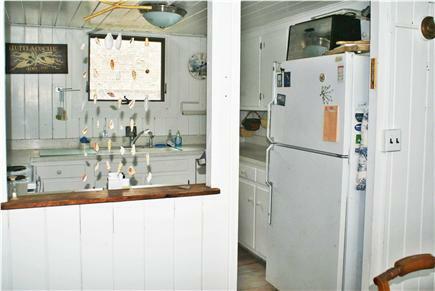 It has a dishwasher, washing machine, dryer, ironing board, iron, linens, towels, beach chairs, a deck with gas grill and outdoor shower. Alice was so good to us. We definitely want to go back! Thank you, Joanne! You were the perfect renter who left the house in tip top condition. Thanks. We recently came back from a week at the Goyert's beautiful Vineyard home and can't recommend it enough. It's close to the hustle and bustle of Oak Bluffs, but set back on a private lane and positioned so that there is not a neighbor in sight. 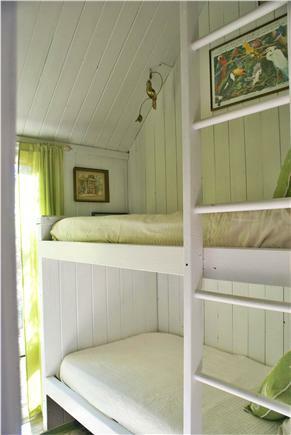 The house is incredibly charming; our kids went wild for the bunk rooms, my mother loved the sleeping loft, and we were so happy to have our own master suite at the end of the hall. The house is charmingly furnished with a hundred interesting details and each room is thoughtfully appointed and decorated. 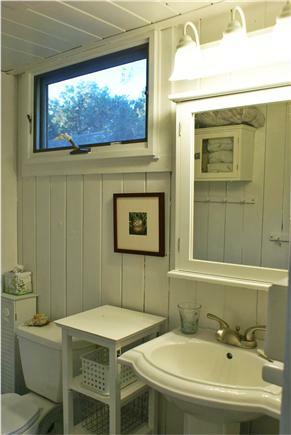 The outdoor shower was a huge favorite and we loved the sliver of ocean view from the deck.